First and to be clear, there’s absolutely no necessity to use a dedicated PC to work with data from a weather station. If you only wish to download and process data from the logger on, for example, a daily or weekly basis then having a dedicated PC would be an expensive luxury and total overkill. And, equally, there’s rarely any problem in using a PC for a limited amount of other basic work even though its primary job may be as a weather PC. Then the second key point would be that the 6555 WeatherlinkIP (WLIP) version of the Davis data logger offers probably the simplest way for most users to upload weather data automatically to the weatherlink.com service on the Internet and to other weather networks such as Weather Underground. This WLIP logger is all you need, along with a wired Internet connection, to upload and to see your weather data online. But remember that the 6555 logger is higher-priced because free-for-life access to the weatherlink.com service is rolled up into the initial purchase price and also that the data presentation will have limitations compared to what is possible with a dedicated PC. Further details are available on the specific WeatherlinkIP page. But for users seeking a more comprehensive or flexible or bespoke data presentation the picture starts to change. This is especially true if you’re planning to use the PC to download data from the weather station continuously, 24/7, or if you want to run a weather website with frequent uploads. If the PC is also used heavily for other work then it would be well worth considering getting a dedicated weather PC — there’s always the possibility that other software might interfere with operation of the weather software, at least by causing PC crashes or requiring reboots after updates, if not for reasons of performance. This is particularly true if the PC might also be used by other users with different logins, which typically wouldn’t be compatible with simple operation of weather station software. But do remember that setting up and running a dedicated weather PC that is in any way different from your main PC (a Raspberry Pi unit, for example) will require some background knowledge of how to use such devices. This isn’t necessarily difficult to do, and for many users it can be an interesting and rewarding project in its own right. But for non-expert users looking for a simple, turnkey solution to getting data online without using their main PC then the 6555 WeatherlinkIP logger is probably the better option. NB This page primarily deals with various types of PC hardware – there is also a choice of software to be made, appropriate to the chosen operating system of course (i.e. Windows software for Windows PC and Linux-compatible software for Linux devices) – see elsewhere for details. Remember also that if you already have a Windows PC that you’re happy to run 24/7 then by adding a 6558 1-year or 6559 3-year weatherlink.com subscription to the standard Weatherlink software you can have a system directly equivalent to WeatherlinkIP. Also, tablets and phones typically cannot receive data direct from a weather station. A tablet may be very handy as a secondary viewing device, but first requires a PC to generate the data presentation to be viewed on the tablet. **SBC is shorthand for a Single Board Computer, which are miniature modern computers that come in a range of guises of which the Raspberry Pi is a well-known example. Different versions of such devices can nowadays be bought using either Windows or Linux as operating systems. NB This is not a hard and fast classification – there are devices that arguably have features from more than one category, but it’s a useful starting point to understand the options. Remember also that some weather software will run only on particular operating systems (most commonly Windows) or has minimum hardware requirements and so inevitably there is a trade-off between hardware and software choices. Some further comments on each type can be found below. This is the most obvious and commonplace option, though not always the optimum solution. It will offer the widest choice of software (see examples page for illustrations). In recent years the price of entry-level PCs – which, as above, usually possess perfectly adequate performance – in this class has reduced markedly and is now often in the £150-£200 band. Entry-level Windows laptops may be especially appealing as a compact, neat, all-in-one PC with few cables needed (one to the weather station and maybe one to a mouse, if preferred) and with built-in WiFi for Internet connectivity. 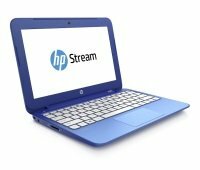 Caveats about such laptops would include considering whether it’s a good idea to run the laptop continuously with its battery connected (may be better to remove the battery? ); and a slight concern about the longevity of the eMMC memory with which such laptops are often fitted – as ever, a regular backup of weather data files is thoroughly recommended, just in case. Devices like Intel NUC and Gigabyte Brix: While these can be bought in ready-to-go form, a more cost-effective option is to buy the bare-bones versions, which typically require memory, hard-drive and operating system to be added. This is in fact relatively simple to do, but is obviously more suited to users with a little experience in hardware assembly. The great benefit of this approach is that a quality product can be created but with a specification to suit the individual user, eg if you prefer to use an SSD drive for storage and Linux as the operating system then it can be achieved at a good price. The result will be a powerful but compact unit able to handle any amount of weather data processing that might realistically be needed. Comparable, fully finished devices from e.g. Chinese factories that are sold under less familiar brand names such as Justop, Quantum Byte, Sumvision Cyclone, Minix Neo etc and available from Amazon amongst other outlets. These are typically sold at around the £100 mark with Windows 8/10 installed and often targeted at Smart TV or streaming media applications (though just as suitable for handling weather data). While these devices are reported to work well as weather PCs, there are some potential concerns about possible overheating of certain of the fanless designs, display driver compatibility and also again in the use of eMMC (rather than good quality SSD) for permanent storage. Devices like the Intel Compute Stick, which is a still smaller (100x37x12 mm) analogue of the NUC described above and designed to mount directly into the HDMI socket of a suitable display monitor. In truth, the Compute Stick is not ideal having only a single free USB port and therefore really needing to be used in combination with a small USB hub to allow connection of weather station and keyboard/mouse. And, once again, the use of eMMC as memory is a minor concern. (Although either communication with e.g. a WeatherlinkIP via the WiFi link or use of the Compute Stick in a headless configuration would presumably work fine.) But the Stick is interesting as an example of one direction in which PC design is heading. Overall, the ways in which the various PCs described in this section can be used will be diverse. But, in the main, the most likely configuration will be the familiar one with display, keyboard and mouse attached to create a standalone PC running Windows software of one sort or another. Equally, however, if the user preferred, the operating system could be a Linux variant, which would make it significantly simpler to run headless, i.e. with no display etc attached and with the PC being controlled from another device on the network. It’s inevitable of course that PC design will continue to evolve and new small desktop PCs will launch during 2016 and beyond. So the above should be read simply as a summary at one point in time (Dec 2015) and with the expectation that other newer devices will always be launching into the market place. SBC’s typically have lower component resources, eg slower processors, less memory etc. They are therefore still cheaper and consume even less power when running 24/7 but also, as a result, cannot effectively run Windows. They are therefore best viewed as Linux-only devices, which of course limits the range of compatible software to programs such as Cumulus MX and weewx. However, be in no doubt that even an SBC like a Raspberry Pi can be the basis of a highly capable weather PC and that a program like Cumulus MX is still full of powerful features. Users previously familiar only with Windows will find it a minor hurdle to switch to Linux. However, the basics of learning Linux are fairly easy and once some basic configuration commands are understood then actually using the software is little different to a Windows environment. The total cost of eg a Raspberry Pi shouldn’t be underestimated. While the RPi board itself is available for eg £20-30 (depending on exact version), by the time accessories like case, mains adapter, SD card, WiFi dongle etc have been added in then the cost could rise to nearer £60. The RPi is still excellent value but the price gap to other PC options is rather less striking. Remember once again that the RPi uses SD cards for storage, which are likely to have only a finite service life. Backup of weather data files is an essential part of the daily/weekly routine. MeteoBridge is weather station software than can run on still simpler PC hardware which probably represents about the minimum specification that can still support highly effective data handling with Internet uploads. Although MeteoBridge (MB) is software, it is designed to be installed as the only active software on a dedicated hardware platform. The MB host device therefore effectively becomes a MB hardware device – this is its only role in life. This means that the MB device is designed to be a fully self-contained PC that can carry out processing of weather data unattended for extended periods. For example, if mains power is lost then MB can automatically resume operation when power returns. And MB is designed to be operated headless (ie remotely) by default and at long distance if necessary – its host hardware usually has no display available anyway for interrogation/configuration. So MB has extra features baked into its code to allow its basic operation and its management from other devices to be as straightforward as possible – the configuration required for using default services is minimal, for example. 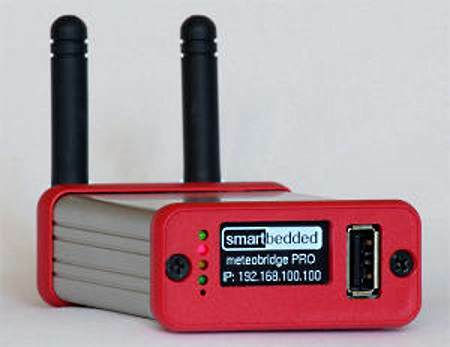 The MeteoBridge Pro Red model even has a receiver built in for reception of wireless data from Davis wireless stations so a MB Pro Red unit plus a set of outside wireless sensors can constitute a complete self-contained solution for sophisticated handling of weather data. MeteoBridge is ideal for users seeking a resilient and self-contained data source that’s as turnkey as possible and with minimal configuration, but which offers much more flexibility than the WeatherlinkIP logger. 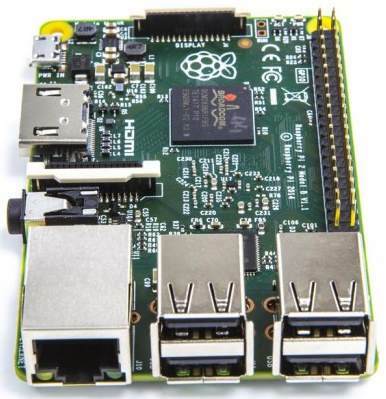 A PC based on the Raspberry Pi 2 is likely to be the cheapest new PC option and still has more than adequate power for number crunching. But remember to back up data frequently.